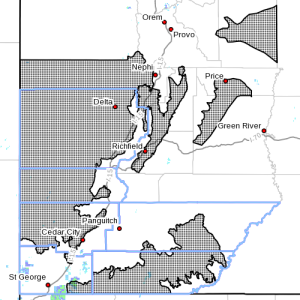 SOUTHERN UTAH — The National Weather Service in Salt Lake City has issued multiple Winter Weather Advisories Sunday for snow across much of the state, in addition to a high wind warning for Garfield County. The National Weather Service in Salt Lake City has issued a Winter Weather Advisory for Washington, Kane, Iron, Beaver, Garfield, Millard and Piute counties from 2 p.m. Sunday through 10 p.m. Monday. The western Uinta mountains, Wasatch Plateau, Book Cliffs and the central and southern mountains, including the cities of Alta, Brighton, Mirror Lake Highway, Scofield, Cove Fort, Koosharem, Fish Lake Loa, Panguitch and Bryce Canyon. Seven to 14 inches with the heaviest accumulations across the southern mountains, and 3-7 inches in the southern mountain valleys. Snow, heavy at times, will quickly move into Southern Utah Sunday evening then spread northeast overnight. Snow will continue at times Monday, decreasing Monday evening. Northwest winds gusting 30 to 40 mph may develop Monday, causing areas of reduced visibility with blowing and drifting snow. 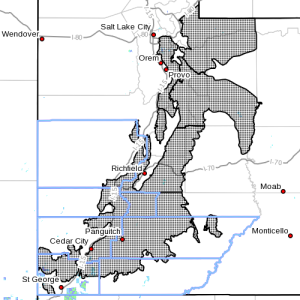 Motorists in these areas should be prepared for winter driving conditions across all mountain roadways. A Winter Weather Advisory for snow means that snow accumulations will cause primarily travel difficulties. Be prepared for snow-covered roads. Use caution while driving. The National Weather Service in Salt Lake City has issued a second Winter Weather Advisory for Washington, Kane, Iron, Beaver, Garfield and Millard counties from 2 p.m. Sunday through 4 p.m. Monday. 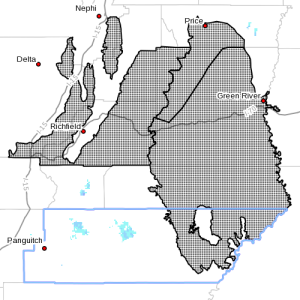 The western Uinta Basin, Castle Country, Sanpete/Sevier valleys, west central Utah, southwest Utah, south central Utah including the cities of Duchesne, Roosevelt, Price, Castle Dale, Emery, Manti, Richfield, Delta, Fillmore, Beaver, Cedar City, Milford, Kanab and Escalante. Generally, 1 to 4 inches with 3 to 6 inches possible along the Interstate 15 corridor from Fillmore to Cedar City. Snow, heavy at times, will quickly move into Southern Utah Sunday evening then spread northeast overnight. Snow will continue at times Monday, decreasing Monday afternoon. Motorists in these areas should be prepared for winter driving conditions. 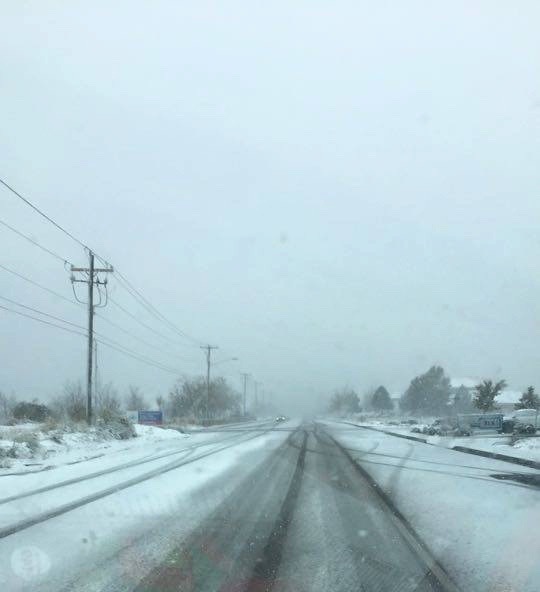 Roads may accumulate slush and snow, including Interstate 15 from Fillmore to Cedar City and the higher sections of Interstate 70 through central Utah. The National Weather Service has issued a high wind warning for Garfield County, in effect from 4 p.m. Monday to 10 a.m. Tuesday. Castle country, and portions of the San Rafael Swell and Central Mountains. Sustained winds of 30 to 40 mph are expected with gusts in excess of 60 mph. Northwest winds developing Monday afternoon and persisting through Tuesday morning. Strong crosswinds could potentially affect travel on state Route 10 from Price to Fremont Junction. With strong winds also possible on Interstate 70 near Ivy Summit and Fremont Junction, and state Route 72 near Hogan Pass. The main impact is expected to be along state Route 10 and Interstate 70 near Fremont Junction. A High wind Warning means a hazardous high wind event is expected or is occurring. Sustained wind speeds of at least 40 mph or gusts of 58 mph or more can lead to property damage. Vehicles, especially high-profile vehicles and those towing trailers can be difficult to control at times in high winds. Motorists should take extra caution, especially while crossing bridges, overpasses and unsheltered areas.